The research resulted from collaboration between the Georgia Institute of Technology and the Gladstone Institutes, and was reported October 5 in the journal Nature Communications. The National Science Foundation's (NSF) Emergent Behaviors of Integrated Cellular Systems Science and Technology Center (EBICS) supported the research. "The goal is to control a system of cells like this to direct tissues to take on different phenotypes, to develop into different complex mixtures, and to self-assemble and emerge into very complicated structures," said Melissa Kemp, an associate professor in the Wallace H. Coulter Department of Biomedical Engineering at Georgia Tech and Emory University. "For developing tissues that could be used as surrogates for screening drugs or as eventual implants for therapeutic purposes, we need to how to control and direct them properly." Despite the importance of local cell-to-cell interactions in evolving multicellular systems, little has been known about how the overall system regulates its morphological processes. 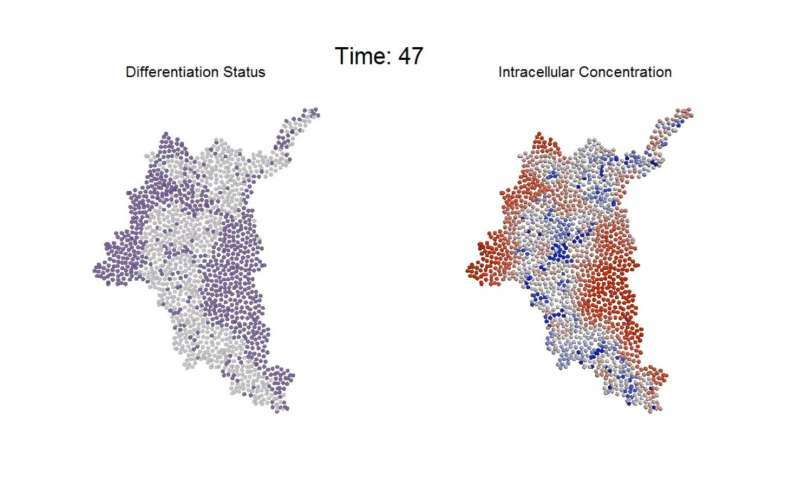 To learn more about this, the paper's first author, Chad Glen, studied how communication between adjacent cells informs the fate of those cells. Beyond understanding this communication, Glen discovered a potential mechanism for "braking" the rate of differentiation without affecting the overall patterning of the resulting multicellular tissue. "The amount of coordination among cells that are tightly coupled gives us an idea about how they work as a group," said Todd McDevitt, senior investigator at the Gladstone Institutes and a professor of bioengineering and therapeutic sciences at the University of California, San Francisco. "This reflects the behavior of a team versus individuals. They really do coordinate activity in a rapid way. This study shows how quickly some important cell behaviors are mediated by gap junction communication." On a larger scale and in three dimensions, such changes lead to development of bodily organs. Understanding how that happens—and how it could be controlled—could be key to directing this transition from individual cells. 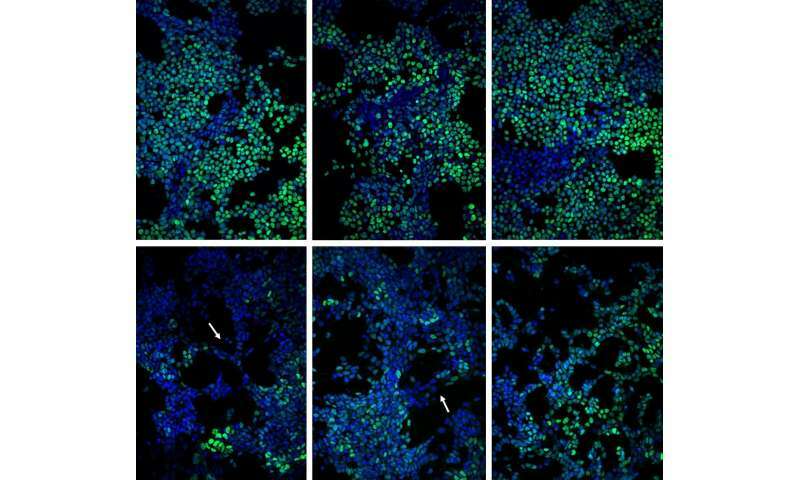 To understand and measure the cell communication process, the researchers used a fluorescent dye to show when signaling molecules had moved from one cell to its neighbors. They then used a laser to bleach the dye from a single cell. Measuring how long it took for the dye to be replaced showed the permeability of the cell membrane—and how well the cell was communicating with its neighbors. "If you zap a cell and it immediately returns to green, you know there is a lot of fluidity and cross-talk between the cell membranes," Kemp explained. "If you zap a cell and it stays dark, the cell is effectively isolated and has no communication with its neighbors." By partially blocking communication between cells and otherwise perturbing the communications, the researchers slowed the differentiation process—but didn't change its pattern. "We were able to shift the way the cells were behaving to slow things down—effectively 'braking' the process—while preserving the spatial information," said Kemp. 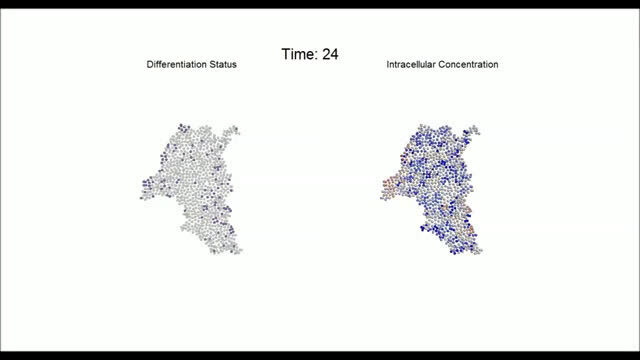 "Cells that were at 48 hours in the process could look like 24-hour cells." "With modeling, you can study a much larger set of conditions and parameters than we could experimentally," he said. "The model could make predictions that we could go back and study experimentally to see how those conditions actually affected the behaviors. The behaviors we measured experimentally matched what the computer predicted, and validated that we had a robust model." "We have demonstrated in a series of papers over the past six years that this system's complexity can be modeled," he said. "This paper represents a further step toward the greater goal of integrating information about this system. With each of these steps, we are much closer to taking a bigger leap into potentially controlling these systems." Eggs of Birds are more compliant for this kind of Research; Keep injecting appropriate chemicals at required times into desired locations of the growing embryo ! Also, Work can be done on thousands of Eggs at a time.